About six weeks ago I started to experiment with R H Multigrain bread flour. I had no prior bread baking experience just pizza dough. Robin Hood is the premier flour brand name on this side of the border as opposed to King Arthur. Don't know what the Round Table has to do with flour but there must be some connection. 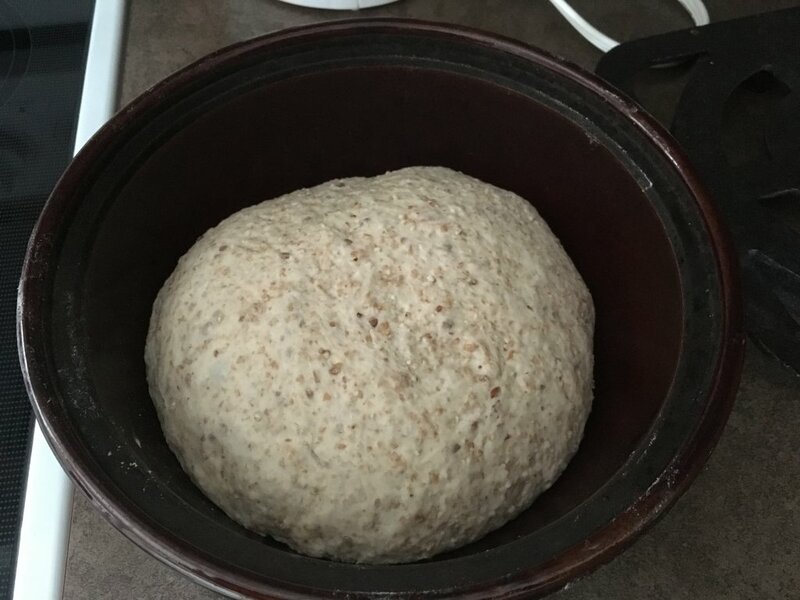 I started out using bread machine recipes but as in pizza dough I began to experiment with smaller amounts of yeast, longer fermentation and hydration levels from 63% - 70%. Incorporating autolyse into the bake worked well giving the grains a chance to absorb some moisture before adding the other ingredients. In my pizza bakes I have always used ADY. With the bread machine we bought the bread machine IDY. One day I saw Fleischmann's Quick-Rise IDY and decided to give it a try. The results have been excellent. I'm consistently achieving excellent fermentation in 6 hours with 1/4 tsp of yeast. I place dough in the oven, light on, covered with wrap. 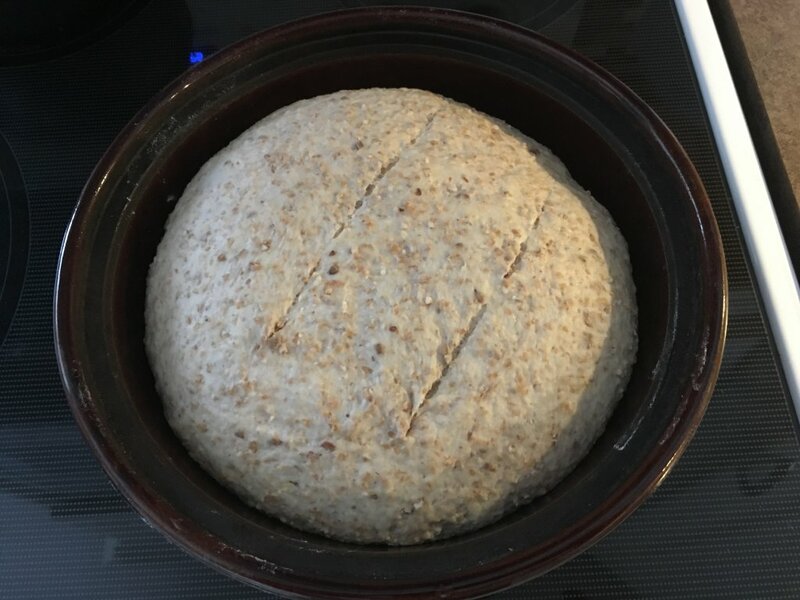 I've tried various methods for the second rise and bake including an open bread pan and bake at 400˚F, a hot dutch oven, 450˚F and the "Poor Man's Dutch Oven" method where the bread rises in the cold pans and is inserted into a 450˚ oven. It's fair to say my best results have been with the bread covered and baked at 450˚F. After the first rise, roll out on to lightly floured surface, spread the dough out with floured hands and form into a dough ball. Place in dutch oven and let rise about 90 minutes uncovered. Place in cold oven. 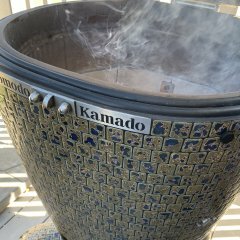 I used a pizza stone set on the lowest rack to diffuse heat from the bottom of my D/O. Set oven to 450˚F. My oven took 21 minutes to come to temp. Bake for 20 minutes with the lid on. In this case I removed the lid and baked for a further 7 minutes. that looks awesome Kman!! I mostly use the breadmaker but I'm thinking of venturing out. I'm going to give this a shot as one of my first attempts. Thank you. I still like the bread maker to do a short mixing of the ingredients. I do the autolyse in the bread maker but I just let it mix the water and flour for 30-60 seconds. Then after the autolyse just to combine the ingredients especially the butter and yeast. After that into a bowl and into the oven. I pretty much do the same thing with my pizza dough now as well. Poor Man's Dutch Oven White Bread. Cold oven bake. Removed to bread pans for 1-1/2 hours. Turned on oven, 19 minutes to come to 425˚, baked 25 minutes more. Wow - that is a beautiful loaf of bread, @K'man! Well, they both look good... but the multigrain one is a work of art. I sure wish I knew more about bread making. When I cook, I tend not to use recipes very often and I avoid measuring at all costs. That is kind of the antithesis of baking, where those things are critical. I need to learn the terminology so I can better follow along when reading these posts. Maybe one day it will click and I'll get it. That is some fantastic looking bread! I am going to try the cold oven method. It could save a lot of time and energy.